Back again for another week of BootyBuilding! I’ve been completely wrapped up and spoiled with some long overdue family time this past week in Canada, but even during travels and holiday I need to keep my body moving. After long hours of travel, sitting on a plane and time changes, my body feels a whole lot better after a good sweat out. I sometimes get a gym day pass but my parents yard is so beautiful, I felt inspired and wanted to be creative and get my workout in without having to leave the house. 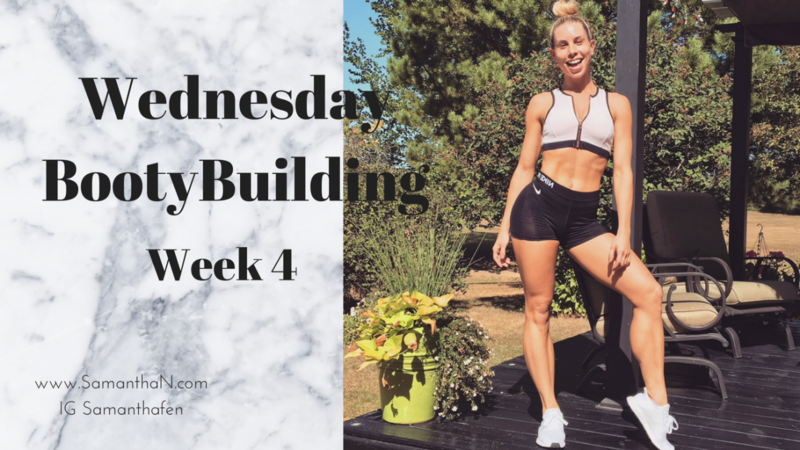 So this weeks Wednesday BootyBuilding is all about a full Booty workout that you can do while traveling and with no equipment and limited space. You don’t always need a full gym with heavy duty machines to get your pump on. Last weeks workout was based around one single resistance band (click HERE for that workout) and this week all you need is your loop resistance bands and body weight. Simple to travel with and still a solid workout… I was burning by the end! This circuit is also based on super sets, so combining 2 exercises into one and then allowing for a pause, that way you’re getting your heart rate up and able to get more done in a shorter amount of time. Hip Bridges into butterfly rotation… my dance friends should especially enjoy this one for strengthening and activating your hip rotators. With the loop band placed just under the knees, feet together start with a basic hip bridge. Once at the top of the movement, maintain a straight line with pelvis and hips staying up and open your knees as you rotate from the hips. Push your heels into the ground to help activate your glutes. Maintain the squeeze and bring your knees back together to the top of your hip bridge and then lower your pelvis down. Repeat this 15 times for 3 sets. Working on our core as well with this one, get into a plank position with the loop band placed just above your ankles and hands face down on the floor. Start with single leg kick backs, focusing on not letting the pelvis and hips go up or twist and maintaining a straight line from head to toe. Repeat the same on the other leg. Then continue in the same position but now with side toe taps, alternating from left to right. Keep thinking about lengthening through the spine and belly button in. You need your core activated to refrain from twisting in the hips. Do 8 kick backs with the right, 8 with the left, then 16 alternating from side to side for 1 set. Repeat that circuit 3 times. Similar to the last exercise, with kick backs and side steps in plank but now in a standing position. With the loop band placed just above the ankles, and knees slightly bent, begin with 8 leg raises to the side. Focus on lengthening your working leg out of the hip, your lifting your leg not your hip. Keep the tension on the band by not fully closing in, then repeat on the other side. Go directly into your standing kick backs, with standing leg slight bent for staility and back leg straight. Keep your core active and pelvis up right, tendency is to drop the pelvis forward as the back leg goes up, but your lower back is going to take over and those glutes won’t be activated which is not what we want. Repeat 8 side leg raises with the right, then the left and straight into 8 kick backs with the right and then with the left. That’s 1 circuit, and now repeat that 3 times. This one looks kind of funny sped up but its one my favorites and also a favorite of my clients. Starting in a basic squat position with the loop band placed just above the knees, you’re gonna do pulses out while extending and bending the knees. Maintaining the tension on the band take 4 pulses to go up and 4 pulses to go down. Once your at the bottom of your squat position, continue into side steps. As you step to the side the leg that’s coming in goes slightly behind you for that extra pump while also maintaining the tension on the band. Complete 4 sets of up and down pulses, so 4 up 4 down 4 times, and then 16 side steps for 1 set. Repeat that circuit 3 times. Another variation of kick backs and side leg raises with the band. Starting with feet just outside of shoulder width and loop band above the ankles. Complete one squat and as you extend, transfer your weight and kick back with your working leg. Go back into your squat and transfer weight onto your other leg to kick back again. Refrain from letting your kicking leg come in as you extend, the bands resistance will allow for a really good activation of both your gluteus maximus and gluteus medius. Same thing again but now with alternating kicks to the side, focusing on lifting the leg in the hip not lifting from the hip. Repeat 8 kick backs left and right, then 16 leg raises side to side for 1 set. Repeat that circuit 3 times. Find yourself a stair or step for this one, single leg step jumps. With the bands off you can now find that explosiveness of your bodyweight in the jump. Use your arms to help coordinate and push into the ground as you jump, aiming to extend your bottom leg as you jump up. Burn out one side at a time and complete 10 single legs jumps, then alternate legs. Repeat this 3 times. For your final burn out, alternating toe taps into jump squats. Using your same step, complete alternating toe taps 15 each leg. Then going straight into your jump squats onto the step. Maintain the squat position as you go up and down and do 20 to complete the circuit. Repeat this 3 times and enjoy the sweat and burn!